electrostatic discharge, corrosion and short circuits. Sensors help organizations to reduce operational costs, defer capital expenditures, improve uptime, and increase capacity for future growth. 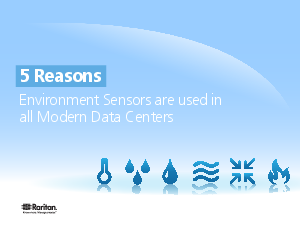 Sensors provide environmental monitoring and alert managers to potential problems like the presence of water, smoke, and open cabinet doors. Sensors can save you up to four percent in energy costs for every degree of upward change in the baseline temperature, known as a set point.